I like to mark a clearly seen line and aim to cut right down the outside edge of the line so I can just see it after sawing. 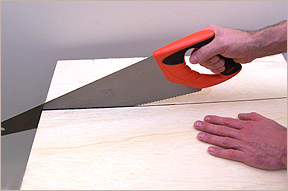 That way your saw is less likely to veer off line because you can see it at all times. When sawing take your time. Hold the saw at quite a low angle(this helps to keep at straight line). Use long slow motions and let the saw do the work. When sawing lengths of timber to size with a hand saw sometimes it's difficult to get nice square edges or accurate angles. A mitre block can be a great help with both. 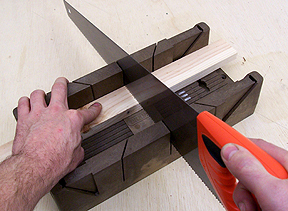 To cut curved shapes from sheet timber use a jigsaw. The narrow blade allows you to cut tight curves. 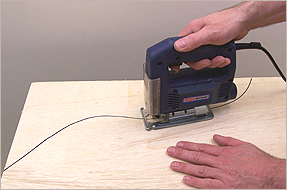 Hold the wood down firmly with your free hand as the jigsaw will vibrate up and down a little.